Looking for that perfect Lent gift? 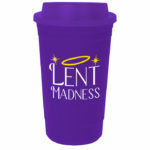 Here you can find Lent Madness goodies. Sure, the selection is small (but high quality! ), though keep your eyes peeled as we’re still on the fence about whether to offer Lent Madness dog collars, emery boards, car magnets, and foam fingers. Keep your wallets open and know that whatever money is raised will go to defray the costs of keeping Lent Madness up and running. 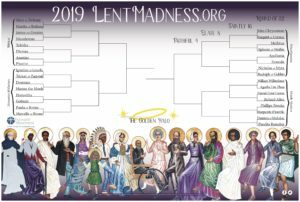 Want a giant Lent Madness 2019 bracket? You have only two choices: either get a magnifying glass and get really close to a standard-sized bracket that you printed yourself, or go over to the Forward Movement website and buy a poster-sized bracket right now! It’s full color, 36″ x 24″ printed on vellum. OK, that last part is laughably wrong, but it’s still nice. Buy a bracket for your parish hall bulletin board, another for your car, one for home, and then get a few dozen for your classmates or co-workers. If you’re on the altar guild, go ahead and get one for your Lenten altar frontal. Everyone’s tired of the same-old stuff from last year. The bracket features all thirty-two saints with plenty of room to write in the winners. Did we mention it’s in full color? Get one for only ELEVEN BUCKS or buy two or more and then they’re only TEN BUCKS. By the way, they ship folded, so there’s no pesky poster tube to deal with. Get yours today! 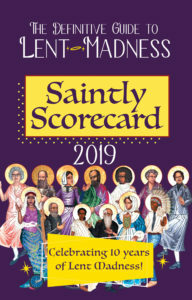 The Tenth Anniversary Saintly Scorecard, our guide to Lent Madness 2019, features the biographies of the thirty-two saints in contention for the Golden Halo. It includes tips on how congregations and individuals can use Lent Madness as a devotional tool, a handy glossary, and full color fold-out bracket. Each copy is hand signed by both members of the Supreme Executive Committee. The printed scorecard is sold out, but it’s still available as an ebook. You’ll agree it’s a real bargain at the low price of just three bucks. In this case, the fold-out bracket is imaginary. You can buy it for Kindle, Nook, or Apple. 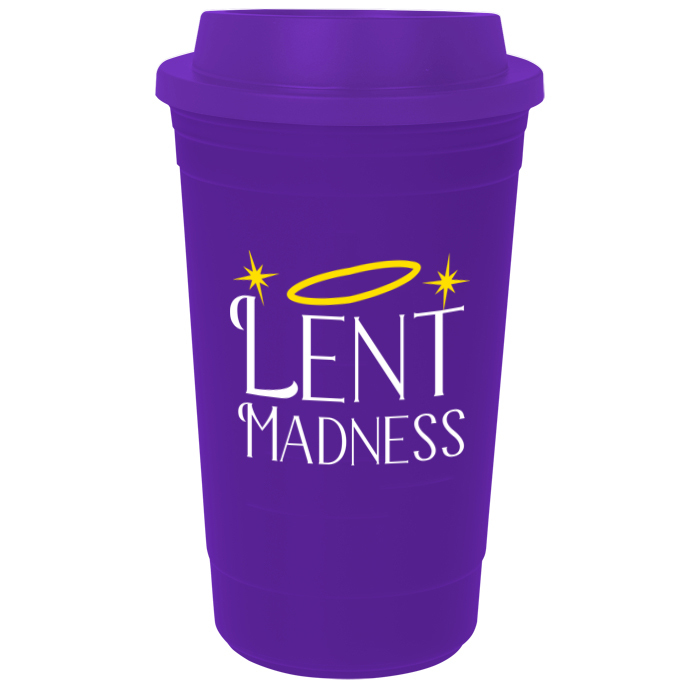 Enjoy your hot coffee or tea in this stylish purple Lent Madness travel mug. 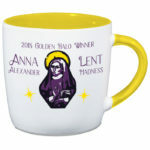 Show your Lent Madness pride at home, at work, or by sneaking it into church! Head over to the Resources tab to see the books our Celebrity Bloggers and Supreme Executive Committee folks have written. You really can’t claim to be a true Lent Madness fan until you own Tim’s book, Dog in the Manger, available in print, Kindle, Nook, or iTunes or the most recently released companion guide Dust Bunnies in the Basket. Scott has co-authored, with the Rev. Melody Wilson Shobe, two books. Check out Faithful Questions: Following the Way with Jesus and Walk in Love: Episcopal Beliefs & Practices. Forward Movement publishes an entire curriculum about the saints, and it’s available free of charge! Designed for use in a congregation, it takes adults, youth, and children through a full year of learning about saints. Download now (adult/youth or children). 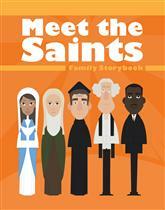 You can also get the most excellent family story book, Meet the Saints, in print form. A bargain at $12, this book will take your family on a journey which unveils how Christ’s light has shone brightly in the lives of men and women through centuries. Learn more about the monks, missionaries, prophets, doctors, evangelists, and more who have led us on our way. Buy now!